Children with significant astigmatism have to work harder to see well. This can lead to eyestrain, fatigue, and even headaches. Rays of light that enter the eye are supposed to be focused by the cornea and the lens to land on the retina, so that we can see clearly. In the real world, the cornea and lens are not exactly symmetrical. Irregularities in the curve of the cornea or lens make vision clearer in some planes than others. This asymmetry of vision is called astigmatism. Most or all of us have some degree of astigmatism. In most people it is so mild an asymmetry that it causes no symptoms. Significant astigmatism tends to run in families and can have a significant impact on vision. Mild astigmatism may produce no symptoms. The greater the astigmatism, the greater the distortion of vision – both near and far. It can cause significant blurring. Children with astigmatism may be too young to notice or describe what they see. They may frown, squint, or pull objects close (to constrict the pupils) in order to try to get a clearer picture. They may also tilt or turn their head. This extra work may lead to eyestrain, fatigue, or headaches. It may be a lifelong condition. It may also improve or worsen as the eyeball grows and matures. 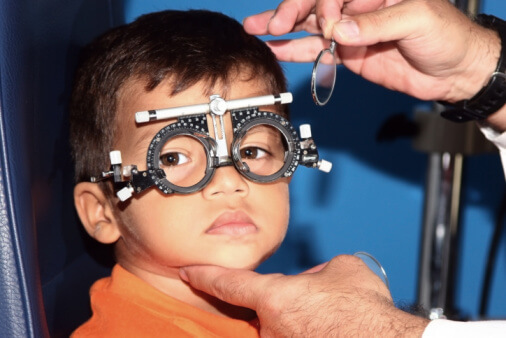 The degree of astigmatism can be measured accurately at any age, without cooperation from the child. The eyes may need to be dilated for the examination. In older children, astigmatism is sometimes measured by placing different shaped lenses in front of the eye, and asking which one allows them to see better. A cylindrical or sphero-cylindrical lens may make vision clearer for someone with astigmatism. Glasses (or contact lenses) may be needed some or all of the time, depending on the extent of the visual distortion and any symptoms resulting from working harder to get a clear image. How can astigmatism be prevented? It is difficult to prevent. Years of poor vision or extra work can be prevented by vision screening. In addition, children whose families have a history of significant astigmatism should have a formal eye exam at an early age.